“Welcome to Half Moon Cay population 45, five miles long and 2.5 wide” our Bahamian nature guide said. 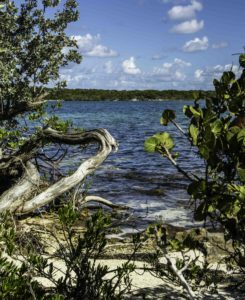 As she led our small group off the sandy road into the island’s dense shady vegetation, we had periodic glimpses of white sand beaches, lagoons and our cruise ship lying offshore. Walking in the balmy warm weather, we knew we’d made the right decision. 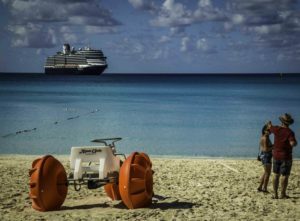 Opting for a Caribbean cruise vacation before the holidays, my wife and I embarked on a four day cruise from Fort Lauderdale to Nassau on MS Nieuw Amsterdam. After an overnight sail Half Moon Cay, (aka Little San Salvadore island), was our first shore excursion. The island is the Holland America Line’s private piece of Bahamian paradise. Ringed by miles of sandy beaches with a central 700 acre shallow lagoon, the lush island flora includes five varieties of palms, orange bark poison trees, wild tamarind and torchwood trees and a natural Viagra called the Love Vine. 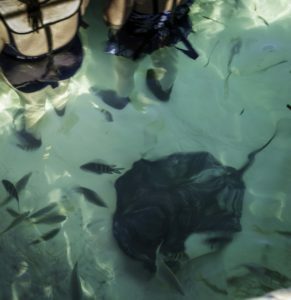 Activities included everything from horseback riding on the beach, kayaking, sailing and swimming with bat rays; to diving on reefs with colorful reef fish, barracuda, and angel and nurse sharks. After our nature walk we settled on the beach and then headed out for a lobstah-roll lunch at a beach side cabana. 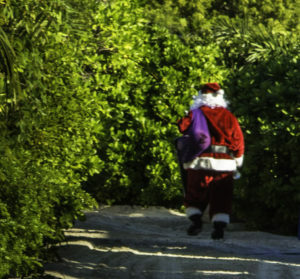 On our pre-Christmas escape, Santa appeared like magic on the beach (sans Reindeer). Good spirited as ever despite being heavily over-dressed, he resisted catcalls from bikini-clad beach goers to shed his red trousers and coat. The tranquility of the bright turquoise waters washed over us as a gentle pleasing relief. With the holidays just weeks away, we almost forgot we hadn’t yet done our Christmas shopping. On first boarding of the cruise ship, we hadn’t been in the mood for the holidays but our one afternoon on the beach at Half Moon Cay fixed all that. Our spirit filling travel experience was heightened by the beauty of our shipboard surroundings. 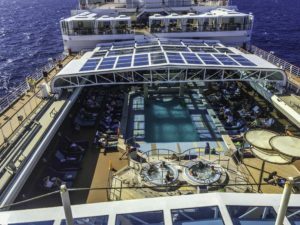 As we wandered the 11 decks, sat poolside, encountered works of art, ate in superb restaurants and browsed luxury shops we quickly forgot that the ship was our home for just four nights. Arriving in Nassau the next morning we were thinking – hmm, what could we pick up for the family, duty free and with highly unique island flavor. Shopping with dollars was easy since the Bahamian currency is set par to the dollar and all the shop keepers prefer US. 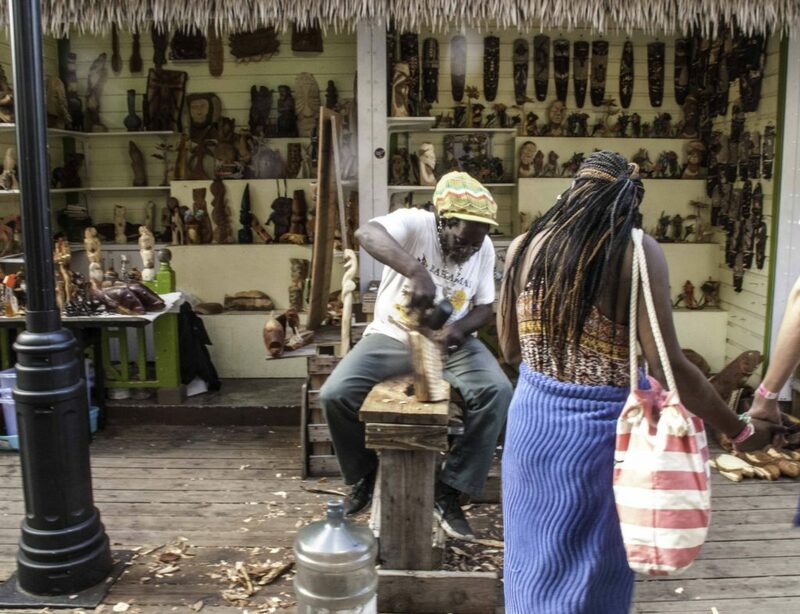 Since Nassau wasn’t victim to the hurricanes that flattened Barbados and St. Thomas, with four cruise ships in port, we found the downtown busy and vibrant. 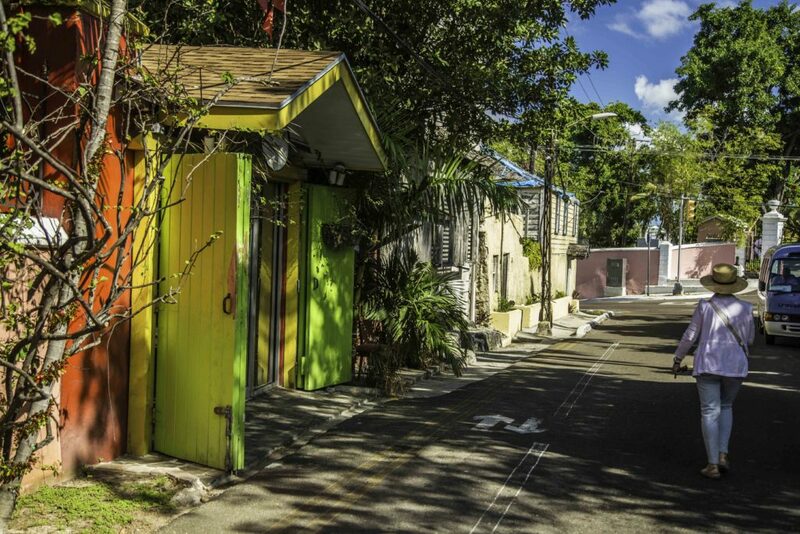 Inexplicably, the lyrics from one of the Beach Boys songs started playing in my head – “We came on the sloop John B, My grandfather and me, around Nassau town we used to roam, drinking all night, got into a fight, well I feel so broke up, I wanna go home……….”. I thought to myself, here we go off roaming around Nassau, but I’m not so sure about the drinking all night and I certainly hope we don’t get into a fight. To get our bearings we set off on an island mini-tour. Our tour bus traversed the heavy traffic of Nassau’s small downtown and drove by the pink Bahamian parliament and court buildings. When the tour bus driver recommended against staying all night at the Bacardi building and missing our ship, the Beach Boys lyrics started playing again in my head – “…drinking all night.” Maybe instead we’d do a nice sunset walk around the Promenade deck; followed by a special Asian fusion dinner at the Tamarind; a night cap at the Lido deck poolside bar; or dancing all night to the music of the B.B. King All Star band. But then again, if we didn’t get to it what did it matter? We were definitely getting into the Caribbean mood. The tour bus stopped at Fort Fincastle and the Queen Elizabeth steps. 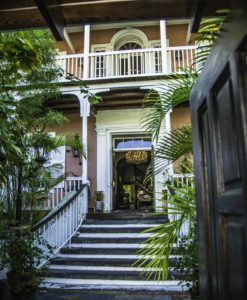 After descending the steep steps with its adjacent waterfall, our second stop was the Greycliff museum and cigar factory. 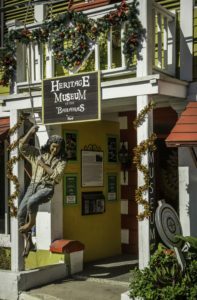 After experiencing the Bahamian history in the Greycliff museum (formerly named Mountbatten House for the frequent visits of its famous English Lord) along with the Greycliff chocolate and cigar factories and its 4-diamond AAA restaurant, we wandered back downtown. After a late Greek lunch (really, straight from Athens), we browsed Bay Street with its high end Fendi, Gucci, Cartier and David Yurman stores. Deciding this wasn’t exactly the type of unique island gifts that we were looking for we ended at the straw market watching native Rasta craftsmen carve their personalities into island woods. Sad to say we came away empty handed, but with our relaxed island attitudes filled up. With the sun was setting we returned to the warmth of our shipboard home. After a very special Asian-fusion dinner at Tamarind we found the beat at the Blues Club rousing and danced late to the beat of B.B. King with the groove of Mo Town thrown in for good measure. Unlike The Beach Boys lyrics, “I wanna go home” – we didn’t wanna go home- but when we had to disembark in Ft. Lauderdale we were definitely in a relaxed warm Caribbean Holiday mood. Happily, it set the tone for our homecoming holiday season. Ships: Celebrating 145th anniversary in 2018, The Holland America Line has 14 ships to choose from with the 15th under construction in Italy for delivery in 2018 and the 16th scheduled for delivery in 2021. In operation since 1873, the line today carries more than 800,000 passengers per year. I can understand now why my British grandfather so admired the Holland-America line. They train staff thoroughly at corporate “Universities” in the Philippines and Indonesia. Service is spectacular, non-obtrusive and courteous. Holland America ships include casino, shopping, spa, salon and fitness centers. 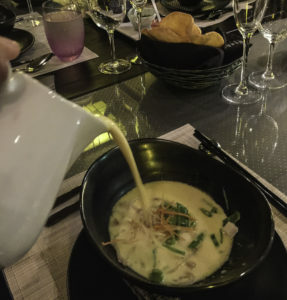 Restaurants: Don’t miss the different culinary adventures at the Pinnacle Grill (fine steakhouse cuts and fresh seafood paired with fine wines) and the Tamarind (Asian Fusion with the best of China, Japan and Southeast Asia inspired by renowned Japanese Sushi Chef Andy Matsuda). We enjoyed Matsuda’s signature Tempura Lobster Tail dish. Tamarind restaurants are available on MS Koningsdam, MS Nieuw Amsterdam and MS Eurodam. Programs: Because Holland America has a partnership with the PBS series American Test Kitchen educational cooking classes are offered on board. Partnerships with the Lincoln Center for the Performing Arts bring special chamber music ensembles to programs in 2018. A BBC Earth partnership brings natural world entertainment through films, shows, children’s activities and theme cruises. Digital Workshops powered by Windows offer opportunities to polish up your skills. 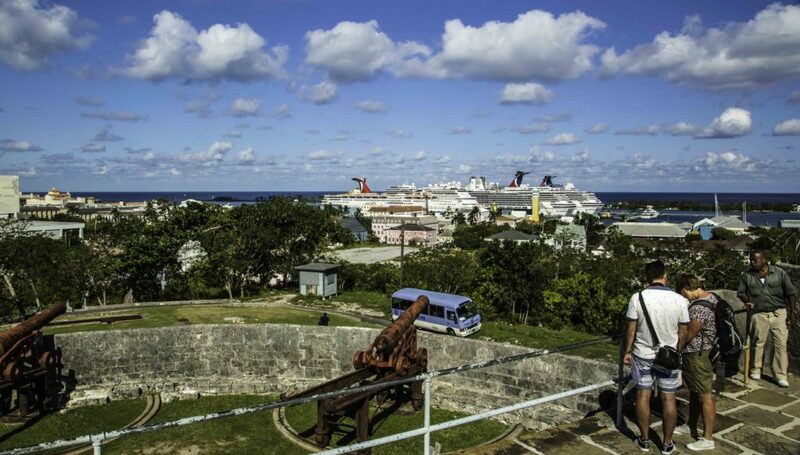 Exploration Central (EXC) programs on our cruise included one on the history of rum running in the Bahamas. Through a partnership with Oprah Magazine, headliners on ship board stages have included Oprah Winfrey, Gayle King, Angela Davis, Glennon Doyle Melton, India Arie, Joan Juliet Buck , Adam Glassman Pulitzer Prize-Winning Author Elizabeth Strout and Comedian Rita Rudner. We really enjoyed the B.B. King Blues Club and dancing to it’s All Star Band. On Stage offers live entertainment from award winning Las Vegas-style production shows. 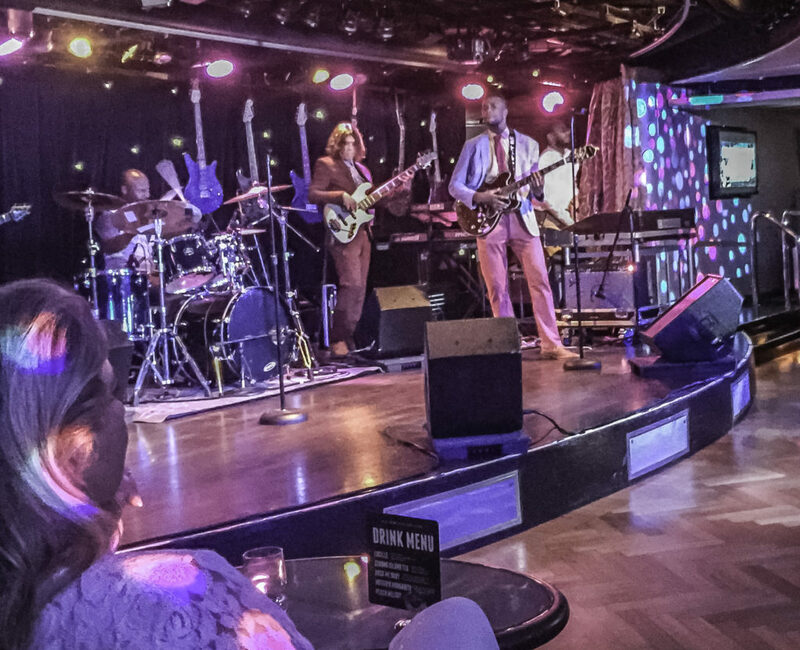 Our cruise featured a Beatles impersonator. Programs of comings events were delivered to us each night by our stewards, leaving tough decisions for overnight cogitation. Art: Ships’ galleries feature art works by talented contemporary artists and masters. Through a partnership with the Rijksmuseum in Amsterdam spectacular reproductions of masterpieces are on display. Art auctions are also a feature of the shipboard experience. Destinations: Cruises are normally seven days, but popularity of the shorter four day cruises has been increasing so check schedules. Cruise destinations include Alaska, Cuba, Panama Canal and Mexico. New Ship Inaugural Cruises: The MS Nieuw Statendam is currently under construction in Italy for delivery in Dec. 2018. A Premier Inaugural 14 day voyage is being offered from Rome (departing Dec. 5, 2018) to Ft. Lauderdale, FL with stops in Cartagena, Málaga, Funchal and Madeira. The ship will then spend the winter season in the Caribbean with a 4 day cruise departing Dec. 19, 2018, Holiday Season cruise departing Dec. 23, 2018 and a New Year’s cruise departing Dec. 30, 2018. 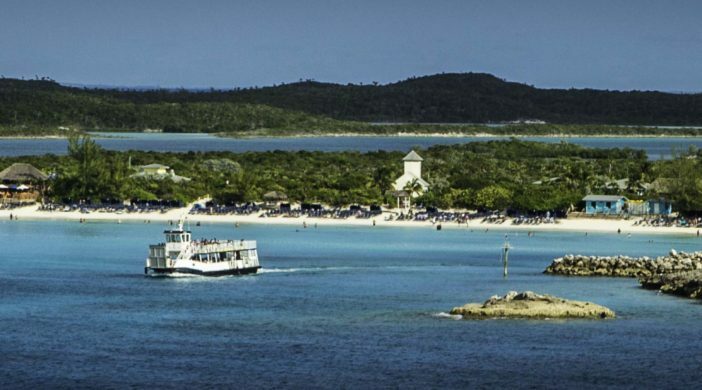 Cruise options in 2019 include a 10 day cruise to the ABC Islands, Half Moon Cay, Grand Turk, Turks & Caicos, Amber Cove, Dominican Republic, Kralendijk, Bonaire, Willemstad, Curacao, Oranjestad and Aruba (departing Jan. 20, 2019). Two travel tips: 1. Five of the lines most popular cruise ships are headed into dry dock at the end of 2017 and early 2018, each for two week 24/7 refit of carpets and stateroom furnishings. The new year will bring all new looks with new menus and a new Lincoln Center Stage. 2. Unlike airlines, travel agents and Expedia receive cruise commissions and may be able to find more favorable rates than otherwise available. Related Article: Read “Dinner at Sea with Holland America Line” to find out more about the cuisine aboard ship. Oh I love the look of the blue blue water and sunny beaches!!! We may check it out next year!